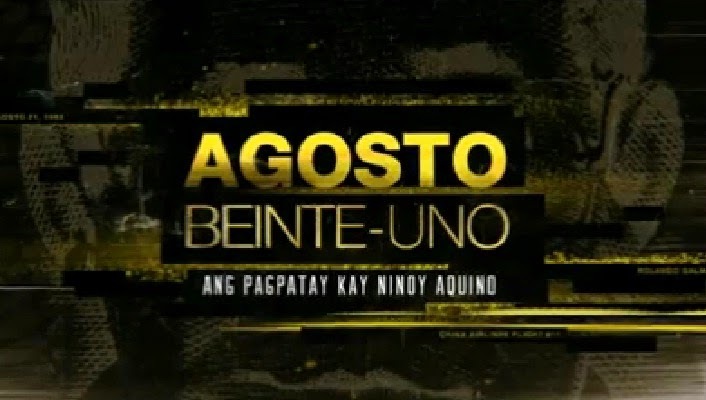 ABS-CBN’s internationally-acclaimed documentary on former Senator Benigno “Ninoy” Aquino Jr.’s assassination titled “Agosto Beinte-Uno: Ang Pagpatay Kay Ninoy Aquino” airs again this Sunday (August 24) to commemorate one of the country’s biggest events in the history that led to the return of democracy. The documentary, which was first aired in 2013, received commendations from different award giving bodies, including a Silver World Medal (Graphic Design: Promotion/Open & ID category) and finalist certificate (Television: Documentary/Information Program category) from New York Festivals, and a Silver Screen Award (Television: Documentary Biography category) from US International Film & Video Festival. More than three decades had passed but Ninoy’s assassination on the tarmac of Manila International Airport last August 21, 1983 has remained to be a huge puzzle for the Filipinos. The documentary, narrated by Jaime Fabregas, has reprised the biggest question of the people in the crime ---- who killed, or who ordered to kill Ninoy? The documentary also aimed to educate the younger Filipino generation on this historical event. Among the personalities who joined the painstaking review of the past were Ninoy’s brother Butz Aquino, Ninoy’s eldest daughter Ballsy Aquino, lawyer of one of the accused in the crime Atty. Mario Bautista, forensic expert Raquel Fortun, former defense minister Juan Ponce Enrile, former human rights lawyer Rene Saguisag, journalists tasked to cover the supposed comeback of Ninoy in Philippines Philip Lustre and Recto Mercene, and more. Time Magazine correspondent Sarah Burton’s sounds on her microcassette recorder, one of the evidences in the crime that has been in the Sandiganbayan’s custody for the past 20 years, was also first heard in this documentary. For the first time, the Sandiganbayan has made the recording available for broadcast via ABS-CBN. Burton’s recording captured the final seconds of Ninoy before he alighted from the plane, the moment he was shot, and the passengers’ reactions when they realized that the person they had just shared a flight with was already dead. Don’t miss the award-winning “Agosto Beinte-Uno: Ang Pagpatay kay Ninoy Aquino” this Sunday (Agosto 24), after “Gandang Gabi Vice,” on ABS-CBN’s Sunday’s Best.